Yay for Forty Autumns! Such a great one that I've recommended to so many people! Sarah - Such a good book! I've read very little about life in East Germany after the wall. Ohhh, Waking Up White sounds like something I need to add to my TBR. 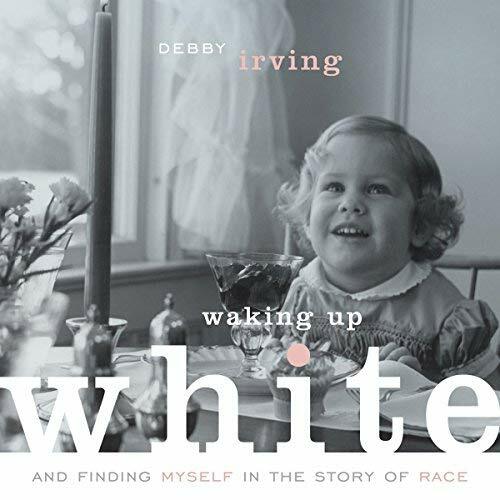 Kelly - Waking Up White gave me a lot to think about. The audio version was excellent! I have Forty Autumns and will be moving it up my TBR pile for sure. Kathy - I hope you enjoy it, too. It might be the first book I've read about life in East Germany after the war. I retired this year and also feel more drawn to reading non-fiction, so I appreciate the suggestions and books that you have read. Lilbitbrit - I've been reading (and listening to) more nonfiction over the past several years. I think some of it is due to all the great recommendations during Nonfiction November! Loved Forty Autumns, too and the audio was great on that one. Waking Up White has me intrigued. Adding it to my nonfiction TBR list which is growing at a rapid rate this week! 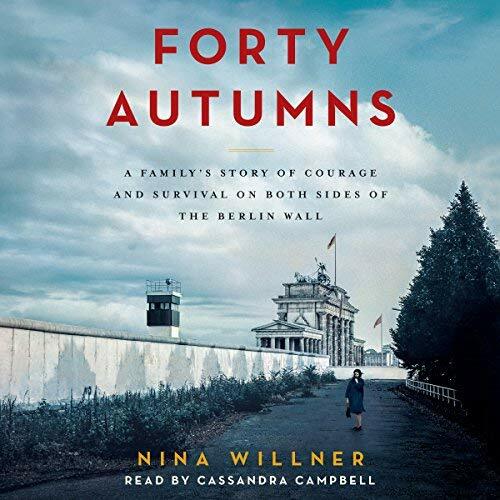 Susie - Thank you again for recommending Forty Autumns! I hope you give Waking Up White a try... the audio is excellent. Katherine - I must be a weather nerd, too ;-) Can't believe I still haven't read The Perfect Storm... maybe 2019 will be the year. Susie at Novel Visits cited Forty Autumns as her most recommended of the year, too. Sounds like it's definitely worth looking into! Debbie - I read Forty Autumns based on Susie's recommendation and loved it. The audio version is very well done. I loved Isaac's Storm! Erik Larson never disappoints. Angela - I agree! Still have to read his most recent book. Have you read his In the Garden of Beasts? Another one with eerie echoes of today. I'm reading Reader, Come Home right now, about the effects of reading in the digital age. Might be up your alley if you haven't already read it. Forty Autumns was really good; I still think about it sometimes and I read it two years ago. Eva - I haven't read In the Garden of Beasts yet, but it sounds like I should move it closer to the top of the tbr pile. Had not heard of Reader, Come Home but just looked it up and it's definitely my kind of book. Thanks for mentioning it! I still think about Forty Autumns, too. Pretty sure it's the only book I've read about life in East Germany after the war. I find that I'm drawn more to nonfiction right now, as I'm not able to concentrate on much else. Traveling is a huge distraction and now my dad is very ill and we are in Seattle this week, spending most of our days in ICU... In any event, I do love to read essays, columns, etc. Most recently, I loved Kelly Corrigan's "Tell Me More." I know this is one I'll read more than once. Speaking of re-reads, I pulled another favorite off my shelf to kick off this month of nonfiction. It's called Birdbaths and Paper Cranes by Sharon Randall. I loved it when I read it many years ago. It's still very good, but I'm waiting for that one essay that really moved me. I may just spend the remainder of the year dipping into all the nonfiction books in my stacks. Hope you're having a wonderful time in Florida! Les - I'm so sorry to hear about your Dad and pray his condition is improving. Several bloggers have mentioned Tell Me More this week, so I need to get to that one relatively soon. Will look up Birdbaths and Paper Cranes... not familiar with that one. Twin A is visiting us this weekend. Surprisingly, it's easier to get to FL from NYC than it is to get to central NY. Not cheaper though ;-) It's so good to see her! My 8 year old grandson loves nonfiction books like natural disasters, history, science, large machines etc. He asked me to buy him a hardcover copy of Isaac's Storm. I did, and he loved it! Vicki - Wow, he sounds like one smart kid! It's good you're able to supply him with books that interest and challenge him. Wonder if he's read anything about the Johnstown flood? I enjoyed Isaac's Storm and LOVED Worst Hard Time! Forty Autumns sounds quite promising! Maphead - The Worst Hard Time was amazing. The first I've read about the Dust Bowl. Have you read other books about it? Emma - If you're into audiobooks, be sure to listen to Word by Word. The author does a wonderful job narrating. Forty Autumns sounds wonderful; thank you for mentioning and hope you enjoy your November selections. Diane - I started The Radium Girls a couple of days ago and am totally hooked. Not sure if you've read that one, but I'm already recommending it! 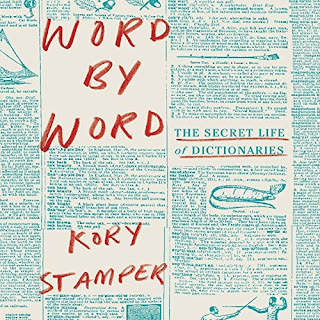 Word by Word was on my list when it first came out, but then I forgot about it. I'm glad to hear you liked it so much. Thanks for joining us this month! 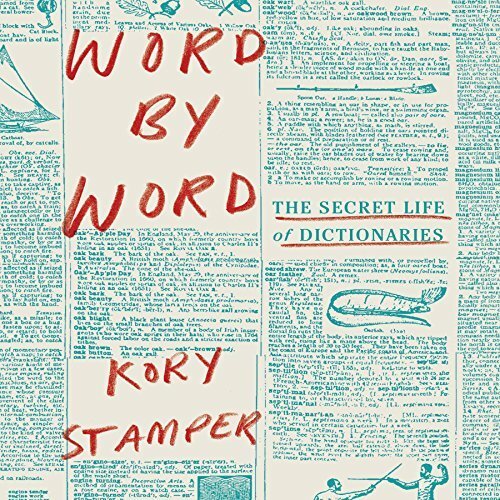 Kim - I never expected to enjoy a book about dictionaries so much! The audio version i especially week done. Louise - That's always the risk when listening to nonfiction, so I always try to borrow a print copy these days. Just this morning I looked at photos included in The Radium Girls, my current audiobook. I agree with you 100%, JoAnn. I find all of my best reads from book bloggers. Thank you for sharing your favorites. I've added two to my list. Glad to hear it, Deb! Walk whilst listening to a nonfiction book sound like a lovely way to spend a little time - I hope you're able to enjoy that some this month. I also get my best nonfiction recs from fellow bloggers. Happy reading this November! Jade - I've been averaging about an hour a day... always one of the best parts of my morning! I'm with you, I can't wait to hear about the nonfiction titles others have been reading and hopefully read a couple myself! Susan - I'm sure both are wonderful in print, too. The audio just added an extra dimension (especially in Word by Word) for me. 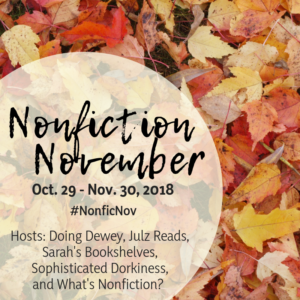 Good luck with Nonfiction November! I’m doing it unofficially because I don’t have time to write extra blog posts. I’m hoping to read a bunch of books about history and health. Thanks, AJ. I'm already recommending my current read, The Radium Girls. You might like it, too, since it's about both history and health. I delighted in Anne Bogel's book -- I love reading thoughtful essays about the joys of reading. Unruly Reader - I don't think I've ever come across a book about books I haven't enjoyed. Bogel's was wonderful! I like your idea of using both an audio and the print version of a book. It seems like a good way to get the best of both worlds. I've been thinking a lot about what is most important to me in my reading and I'd enjoy picking up some books about reading, so I'm particularly interested in the books you've read in that category. Katie - My current audiobook is The Radium Girls. Just this morning I picked up the print edition and found photos of all the girls. It's an excellent book so far! Loving reading non-fiction November posts. I’m not focusing on this myself, but I love getting new titles to put on the list. Best book of 2018 for me thus far is non-fiction. D-Day by Stephen Ambrose—completely readable and absolutely compelling. JaneGS - Sorry for the delay in responding here... not sure what happened. I've never read Stephen Ambrose, though I'm sure my husband has. Will look into his D-Day book. Your nonfiction reads this year have all been fascinating to me. I really admire what I consider your gutsiness in tackling all of these very important books. I am thoroughly thankful for each of your illuminating posts on the books you read. A Stellar Year, though it may not seem like one to you. Judith - Thank you for those kind words. Sometimes it seems like I'm just floundering and reading too randomly, but I get so much more out of books when I'm excited about reading them. Best to just give in, I suppose. The books about race in America have been most eye-opening.